Situated between Annecy and La Roche sur Foron, the Pays de Fillière welcomes you, from the countryside to the mountains, stretching from the Plateau des Glières to the Parmelan, crossing the Plateau des Bornes, including nine villages and bordered by the river La Fillière and its affluents. There are many activities in every season, as well as an important historical heritage such as the Plateau des Glières and Thorens Castle. Join us and meet local producers and craftmen, or simply relax in this peaceful area. The Mont Blanc Express is a scenic mountain train route that runs from the French station of Saint-Gervais/Le Fayet, with a steep climb to the Chamonix valley, all the way through Chamonix and Argentiere, under the Col des Montets and down the other side into Martigny in Switzerland. This beautiful railway takes you through some of the most amazing views that you ever seen. Experience the thrill of outdoor pursuits such as Paragliding (including tandem flights), Mountain Biking, Rafting, Canyoning, Via Ferrata, Water Skiing on Lake Annecy and more with this locally based team. The Tramway du Mont Blanc is one of France’s last mountain rack-rail trains and the highest railway in the Haute-Savoie department of France. 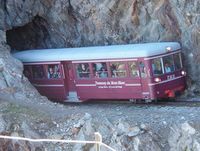 This cog railway winds its way up from Le Fayet and Saint-Gervais, between meadows, pastures and small mountain lakes, via Les Houches to the Nid d’Aigle (The Eagle’s Nest) at 2,372m. A summer ‘must-do’! Master pipe maker of France living just a few doors away from the Hotel Auberge Camelia. Pascal is a charming gentleman – see for yourself when he appeared on French television using the link here. Pascal’s website is in French only.